This is the date for the next TT. I'm currently sitting on two times, Challenge session 1 in 29:30 completed on fresh legs and Challenge session 4 in 29:33 completed on tired legs. This next 20km TT will be completed with a full taper (well 2-3 days) and the goal is to hit a big PB. I'm right in the middle of an FT and V02 block (4months) at the moment and have been getting good results and the guys that have been training with me have also been getting good results, so i'll be looking at raising the bar a little more with the next TT. I did another 20km TT today and improved by 2.5 minutes. I have lost about 6kg since the last TT. Last one is here: http://connect.garmin.com/activity/43427727 And new one is here: http://connect.garmin.com/activity/53009878. I got caught in a bit of traffic in the middle which I guess would explain the heart rate drop. I had my first ride in many moons this morning. I basically watched my average drop from 35 early in the piece to finish @ 33.8. Just can't seem to keep the cadence up. Need to get on the bike more. Bloody windy conditions today during the 20km TT with ATTA series, it was a NE @ 25-30kph. No PB's but only 10 seconds slower. Finally, cracked the top 20 with 14th place overall. The wheels were falling off on the 3rd and 4th lap. 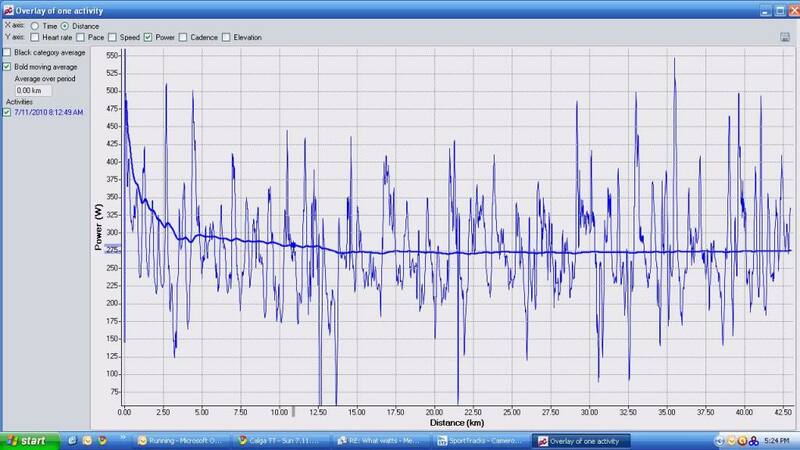 Saturday's hill ride, av hr 141bpm, max hr 181bpm. Just a add a few points . I've done the 20km TT 3 times now on the exact same course and each time I have been slower, however, when you break it down a little more you can see it as an improvement. I also did a hard 4hr hill ride the day before. This was in October and there were really strong winds. Even though my times have been slower I still feel as though I have made some significant improvements. The next TT series will now move the a hills circuit, can't wait for the next one. Today i did a 43 km TT to try and get an FTP to base my Busso bike pacing on. This was on my training bike, with training wheels and NO bling at all. The weekly training load was light (14 hours) after a huge 26.5 hour the week before. 43km out and back, undulating with a couple of bigger hills, nothing too bad though. Avg Power:	291 W, sporttracks tells me the average is 285.6W, not sure which to take. Avg Cadence:	99 rpm, this is what im happiest about. ive been working on it alot and can now see results. I think this shows that although I went out a little too hard it really didnt effect me too much as the last 5 km you can see a slight increase in power output. Alex, or anyone else, Can I be rude to ask if these were your power figures, what power would you be aiming for at Busso? Im happy to share the tcx file with interested parties. Did my first ever 20km TT as a base line for the start of a bike block. I rode 3 hours on the dot at Shepparton, not really sure how much improvement I can expect in a year, but love the half ironman distance and want to focus on that, hoping to get to Shep again next year.